Book review time! 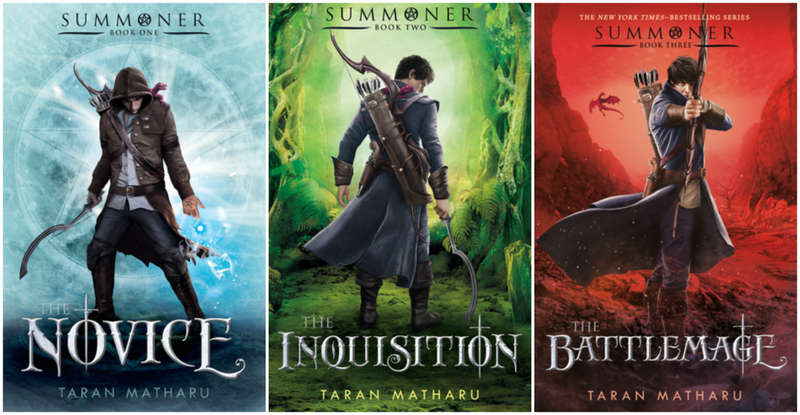 I’m a part of the FFBC book tour for the newest book in Taran Matharu’s Summoner series – The Outcast (check out the full blog tour schedule here) and so I was able to read an eARC thanks to the publishers and the FFBC! 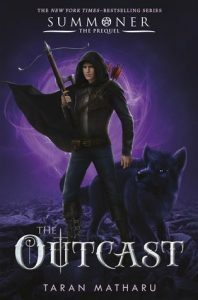 I actually already had the first book in this series as it was a part of World Book Day and probably the book I was most intrigued by, but I knew that The Outcast was a prequel so wanted to read that before starting The Novice. As you might expect if you read my opening paragraph, I thought that this book was awesome! Our main character, Arcturus, is such a kindhearted person and I absolutely love the way his character is written. The story begins with him, a simple stable boy, discovering that he has the ability to summon demons, which in this world is thought to solely be linked with noble heritage. This reveal shakes up the world a little and the King decides to send him to the summoner training school – Vocans Academy. Arcturus realises he can summon when he accidentally summons a canid, who he goes on to name Sacharissa (Sacha for short). Now, Sacha will probably be your favourite character. Described as an oversized dog with four eyes, she’s super adorable and protective of Arcturus, with their relationship being one of the sweetest I’ve ever read about. They’re linked in many ways and she’s constantly proving to be a loyal and strong demon who tries her best to keep Arcturus out of harm’s way by any means. When first arriving at Vocans, Arcturus meets some nobles who despise that a “commoner” has the ability to summon, but is quickly able to make friends with a much kinder group of nobles (including the King’s son, Prince Harold). Also in this group is the adorable Elaine, who is probably one of my favourites characters ever. She’s much younger than the others and throughout we see her being even braver, whilst being ridiculously sweet too. We get a quick glimpse into the training that young summoners gain at Vocans, but we also see that there is a rebellion on the way, mostly due to the King’s poor leadership. 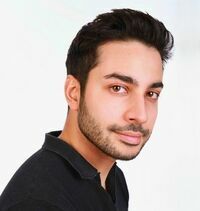 The characters end up in a situation where they have to act to try and save the Kingdom, a huge ask of such a young group of character but Taran describes their personal journeys in a way which makes you remember their age and see how hard it is for them, making the story all the more believable. One thing that personally made me really love this book is the anti-sexism that it promotes, I know this should be unnecessary and there were only a couple but still. For example at one point Elaine is able to do something Arcturus can’t, when he states he’s being shown up by a young girl he’s reminded that age and gender have nothing to do with ability. Perhaps if we saw this kind of scene more often in different media it would eventually become common knowledge. Some fight scenes were fast paced to the point where I lost track of what was happening, but then it didn’t make the story any less enjoyable overall and if anything it added a little more action. I finished this book about a week ago now and on reflection one thing I adored about this story is that the emphasis is on the fantasy, the mistreatment of some races and friendship. There are couples who are written very well of course but the story centres around the growing of Arcturus, it isn’t a fantasy where the main character falls in love and does everything because of that love; instead he’s purely acting for his friends and his future. 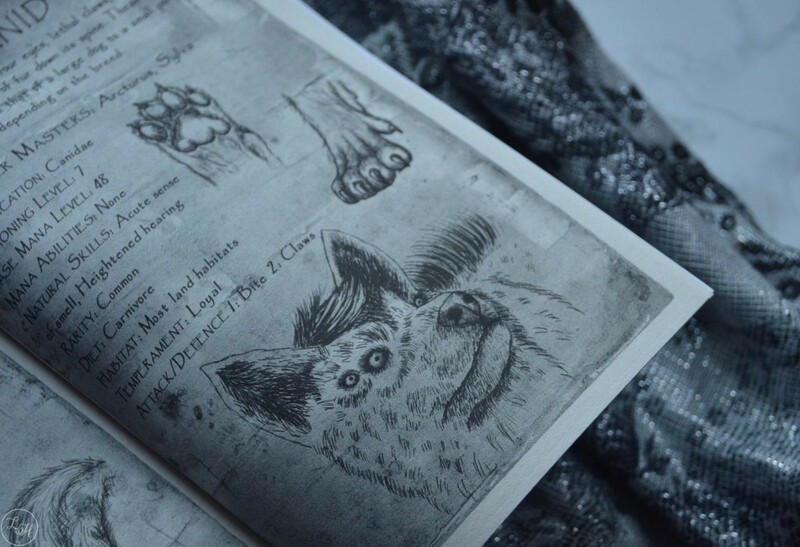 Now, I love the demonology illustrations in my copy of The Novice book, so for a little ending treat to this review here’s a photo of the canid page to show you the characteristics of the adorable Sacha! In the UK? Order this book from Book Depository for free delivery.